Have Bayern spent their way out of trouble? Bavarian nerves had been jangling – Bayern Munich fans endured a disappointing second-place finish to champions Wolfsburg last season, a situation that was only compounded by an inauspicious Bundesliga start that included two draws and a humbling defeat to newly-promoted Mainz. Could the deadly duo of Robben and Ribery bring glory back to Bayern? 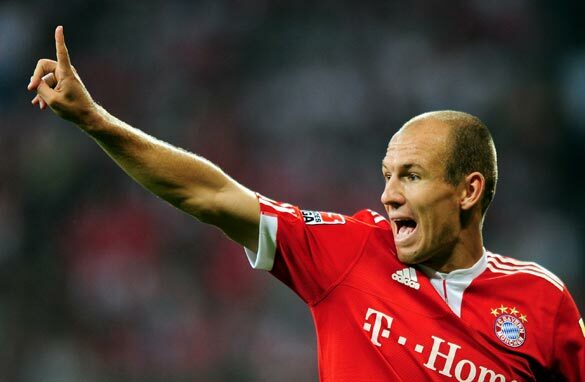 Bayern Munich general manager, Uli Hoeness, responded as best he knows how – and pulled out his checkbook, spending $37 million on former Real Madrid winger Arjen Robben. With his target landed the only thing that remained to be seen was whether the 'flying' Dutchman could live up to his potential. Well, if the the 25-year-old's baptism of fire against defending champions Wolfsburg was anything to go by, there is reason for optimism. Robben made a dream debut, coming on in the second half to net two goals and seal Bayern’s first win of the season. But it was the style of Robben playing alongside Franck Ribery that stuck in the mind. The incredible performance from the attacking duo did much to ease the hurt of Bayern’s worst start to a season in 43 years. And it sent the German media into raptures. The puns were never-ending, and “Rib and Rob”, or “Robbery” were saluted as Europe’s best counter-attacking combination, whilst the Bild paid homage to the “Baylacticos” and their “football from another planet”. Bayern may not possess the star quality of Real Madrid, but the double act will certainly take some stopping this season – Bundesliga be warned. Robben’s addition to the team looks to have given Bayern new life. And their strength up front is undeniable. But little has been done to solve the ills in the team’s defense. Bayern’s big bucks looked to have set the Bavarians back on track. That’s a luxury Dortmund can’t afford – and which will most likely cost them the game. Yeah! I think we are gradually getting to our best.Of course, there is the little problem of our defence.Hopefully Mr van Gaal will fix that too? If you consider that Bayern Munchen is renowned for producing some of the best defenders the game has ever seen.Franz Backenbauer, Thomas Helmer, Sammy Kuffour and Lizarazu just to mention a few.Obviously we can do better in that department.